Joining a coworking space means working alongside people who are chipping away on any number of projects or innovations. 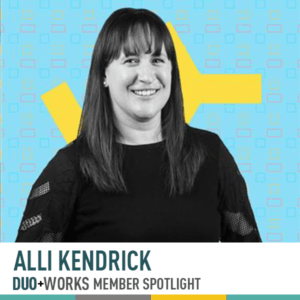 Our member spotlight series is designed to help you get to know what other Duo Works members are working on, so that you can have deeper conversations in the kitchen or maybe even collaborate on a project or two. For this spotlight, it was our pleasure to interview Alli Kendrick. Alli Kendrick is Director of Sales at Embark: a company that provides DNA testing kits for dogs that will tell owners about their canine’s ancestry, and disease risk. But Embark is more than a product, or even a company. It is a promise to share the journey of a lifetime with dogs and their owners. Owners invite Embark, via their dog DNA test and website, into their homes to help them understand and care for their dog like never before. And Embark invites its community to join in making new discoveries in dog health, wellness, care, and understanding via research questions, continual results updates, blog posts, social media, and events. Learn more about Embark at embarkvet.com. Alli, where are you originally from, and when did you move to Austin? I was born in Rochester, MN and came to Austin for college in 1997 and never left. What inspired you to join your company? I joined Embark before we started selling our tests to the public. My dream job was to work with dogs. What’s going on with your business right now? Right now our business is exploding in a good way. Hopefully, you will see more Embark employees in the office in the near future. We love everything about DuoWorks. The huge windows in the office, the quiet working space, the interesting people. Ask me about the non-profit that my husband and I run (Black Fret – a music non-profit that provides grants to musicians). I’m currently binge watching The Good Place season 2.